On 7th February the two members of the “German Federal Parliament”, Ulla Schmidt und Dagmar Freitag, who stayed in South Africa for taking part in the 2019 State of the Nation Address by the South African President Cyral Ramaphosa, used the opportunity to as well visit two DAAD funded Centres of Excellence in Cape Town together with the Consul General Matthias Hansen. They first visited the African Institute for Mathematical Studies (AIMS) in Muizenberg and afterwards the South African-German Centre for Development Research (SA-GER CDR). 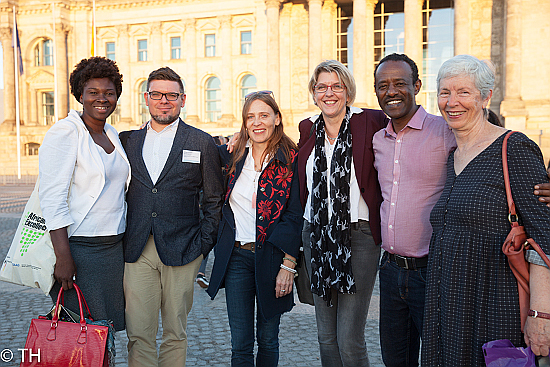 On the occasion of the ten-year anniversary of the Centres of African Excellence initiative by the Federal Foreign Office and the DAAD, a large network meeting was held in Berlin. There are now ten university Centres of African Excellence in Sub-Saharan Africa, set up to train highly qualified future managers and leaders in Africa by significantly contributing to the quality and relevance of selected disciplines at African universities, to the creation of research capacities to the establishment of networks between African universities and research institutes including German partners. For the achievements of the South African-German Centre for Development Research and for more information on the network meeting please have a look at the upcoming IEE-Newsletter (December 2018). 78 Master scholarship holders from 14 countries have been accepted for studies in one of the CDR's Master programmes, 58 grantees completed their studies successfully so far, 16 grantees are still on their way to graduation, the completion ratio will reach 95% after the remaining candidates have completed their studies. Overall, 299 candidates graduated from CDR’s Master programmes. 16% of Master scholarship holders completed two degrees of CDR and 5% have been accepted for PhD studies afterwards. More than 30 Master theses have been published electronically via http://etd.uwc.ac.za/ (a detailed list of MA Theses topics is available here). 25 PhD scholarship holders from 11 countries have been accepted for PhD studies at CDR, 16 of them completed their projects so far, 8 are still working towards their graduation. The completion ratio will reach 96% after the remaining candidates will have completed their projects.Overall, 35 PhD candidates graduated from the Centre’s PhD programmes. All PhD dissertations have been published at least electronically. A detailed list of PhD Theses topics and links to publishedd theses are available here. Additional training offers such as seminars on report writing, scientific writing and presentation have been widely implemented. These training offers have been complemented by regular team building events. Since 2013 CDR in addition offers a career training event for scholarship holders once a year to support labour market integration. Short term support has been given to CDR Master Scholarship holders for study periods in Germany. About 10 CDR PhD scholarship holders had the opportunity to complete short-term stays at Ruhr University Bochum to take part in structured course work of the PhD IDS or other PhD related events like the PhD conference in International Development Studies. Co-operation activities in research and higher education with additional partners in South Africa, in other Sub-Sahara African countries and in Europe have been established widely. An Alumni network and Alumni activities have been established. In 2016, CDR took the lead in establishing joint Alumni activities of all African Excellence Centres and applied for DAAD funding of an Alumni conference on Tackling the root causes of displacement in Sub-Sahara Africa, which took place in November 2017 in South Africa. 40 Alumni (15 female, 25 male) representing 11 countries and 5 African Excellence Centres as well as staff members of CDR and partner centres took part. On the occasion of the Alumni conference a CDR Alumni took the initiative to establish an African Excellence Centre Alumni group. 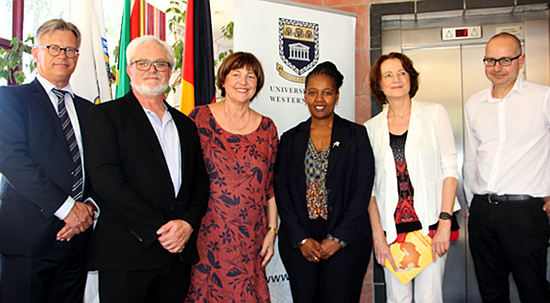 A working group of representatives of different African Excellence Centres has been established and has met at UWC in 2018 to register the Alumni association and further develop its concept. They will soon report on the latest developments. There is no Call for scholarship applications in 2018, but we will publish a new Call in 2019 for both, Master and PhD Scholarships for the intake 2020. Please have a regular look at the Website for further announcements! The second Alumni Conference of the DAAD African Excellence Centres will take place in Accra, Ghana, from 6th - 9th November 2018. The Call for applications with the deadline 6th July 2018 can be found here. Our former DAAD scholar Faustine Wabwire will be the Senior Manger for Policy and Congressional Engagement with "Management Sciences for Health" and will so lead the organization's global health policy agenda and serve as well a the liaison with US Congress, donor countries and partner countries and the business community! She is based in Washington DC. Our former DAAD scholar Dr. Davison Muchadenyika was accepted in the Young Professionals Program of the World Bank and will work as Urban Specialist in Washington DC from September on. 6 new scholarship holders commenced their studies at the South African-German Centre for Development Research. 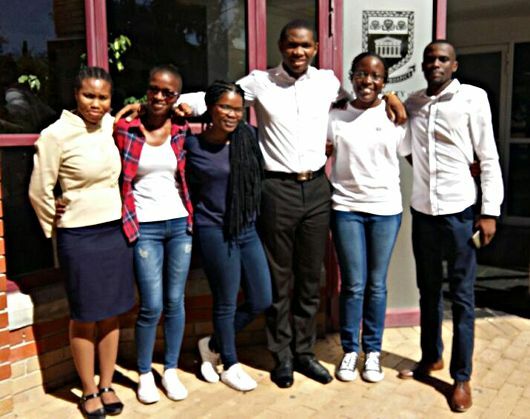 While Abioseh Bockarie and Phoene Oware were admitted to the PhD in Development Studies, Stanley Egenti, Xego Kumbula and Melisa Dlamini started with the Master in Development Studies and Langton Moyo with the Master in Public Administration. Samson Osei, PhD candidate at CDR, published a paper in the Africa Development Bank Evaluation Matters Magazine, titled "Value Addition of Organisational Evaluation". Basically, the paper argues that evaluation of the organization as a unit of analysis remains a black box as opposed to project and programme evaluation in development evaluation practice.” Thus, a comprehensive evaluation of an organisation as a unit of analysis can help achieve the sustainable development goals. The paper can be accessed here. In case you don't see a Full Screen button you should be able to access full screen in the context menu, with a right click on the video.